Thousand Years: Now or Later? Up until two years ago I had no idea of what Amillenialism was. I was so intimidated by Revelation 20-21 that I forbid myself to even go there. I actually only listened to a few studies in the last ten years on those chapters because I just couldn’t understand it. Last year while writing this new book, I decided to go at those chapters head on because I came across something I couldn’t explain. I had no idea what Rev 20 was except that it was a future event and I knew the copy/paste talking points. After six months of reading my Bible and comparing scripture with scripture I was finally seeing what was going on here. I made a point to not google anything or listen to any study or read any book on the subject. These chapters weren’t anything like I was told by these “prophecy teachers”. It was just the opposite. After wrestling with all of this for six months, by “chance” I had come across G.K.Beale and Kim Riddlebarger and guess what…they were interpreting scripture just as I had seen it. Let me tell you something, I literally would lay in bed thinking about Revelation 20 and going over scriptures in my head for six months straight. I was literally losing sleep over it. I would go to work and think about it all day. Compare scriptures every chance I got. I was 3/4 of the way through my book and put it on hold because of this monkey wrench thrown at me. Then I had to go back and re-write some of the book because I knew in my heart that what I was seeing was what Jesus was showing me. It was all Truth. I don’t technically consider myself Amill except in the case of Rev. 20. There are some things I don’t agree with in the reformed camp (one being preterism). I will say that Kim Riddlebarger is someone I agree with 99% of the time. I believe he is spot on. The bottom line is this. I was told one thing my whole “saved” life and never questioned it until I actually read it for myself. I cant make anyone see how the scriptures are written but the Holy Spirit can. You want to know why? Because He is the Spirit of Truth and He will show you all things if you can accept that your wrong. I did that, I can do that and I will do that. When I’m wrong I’m wrong. So I want to share Voddie Baucham with you. 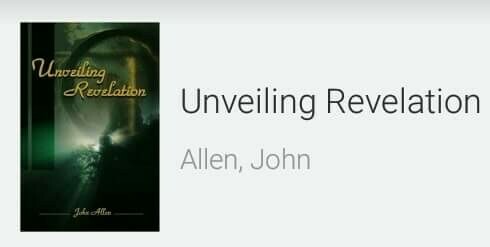 I took a few snippets from his sermons that should make you question what you think on Rev. 20, only if you can be honest with yourself and scriptures. What is the 1st and 2nd Resurrection and 5 Questions that need answered for a future “1,000 year reign” of Christ. I am starting to see that I have a lot more questions than answers when it came to a future reign of Jesus. To know He rules and reigns now has answered all of these questions. I’ll leave it at this…read John 5. What do you see? This section of scripture always stumped me until I finally could see what was being said by Jesus. To be Born Again is to walk in that Resurrection power that Jesus has given us. Pay attention to the mention of “the hour is coming”..twice. And please, if you disagree with this, save yourself a debate. I’m really not in the mood to play games anymore when it comes to Scripture. 1) What was Peter specifically waiting for? 7 But the heavens and the earth, which are now, by the same word are kept in store, reserved unto fire against the day of judgment and perdition of ungodly men. 8 But, beloved, be not ignorant of this one thing, that one day is with the Lord as a thousand years, and a thousand years as one day. 9 The Lord is not slack concerning his promise, as some men count slackness; but is longsuffering to us-ward, not willing that any should perish, but that all should come to repentance. 10 But the day of the Lord will come as a thief in the night; in the which the heavens shall pass away with a great noise, and the elements shall melt with fervent heat, the earth also and the works that are therein shall be burned up. 11 Seeing then that all these things shall be dissolved, what manner of persons ought ye to be in all holy conversation and godliness, 12 Looking for and hasting unto the coming of the day of God, wherein the heavens being on fire shall be dissolved, and the elements shall melt with fervent heat? 13 Nevertheless we, according to his promise, look for new heavens and a new earth, wherein dwelleth righteousness. 14 Wherefore, beloved, seeing that ye look for such things, be diligent that ye may be found of him in peace, without spot, and blameless. Do you see the parallels to these scriptures? “Do you not remember that, when I was still with you, I told you these things? Now you know what is restraining him, to the end that he may be revealed in his own season. “The binding and release of Satan before the parousia and his destruction at the parousia are parallel to the restraint, revealing, and destruction of the “man of lawlessness”in 2 Thess 2:6–12 The binding of Satan now, but his release shortly before the parousia, also is consistent with 2 Thess 2:6–12 where “the mystery of lawlessness is already at work,”but “the one whose coming is in accord with the activity of Satan”currently is restrained. When the restraint “is taken out of the way . . . the lawless one will be revealed.” In fact, both Revelation 20 and 2 Thessalonians 2 are parallel in multiple respects, including the essential order of the events they describe. Sydney Page highlights the parallels between the two passages: Both passages speak of a restriction that prevents a major outbreak of evil for a limited period of time but that will eventually be removed, with the result that there will be a period of heightened opposition to God that will be brought to an end by divine intervention. 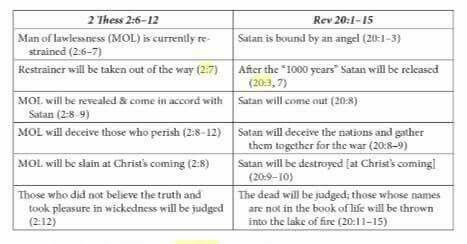 Besides having this basic sequence of events in common, Revelation 20 and 2 Thessalonians 2 exhibit a number of similarities of detail. The overarching sovereignty of God is emphasized in both accounts. . . . Both accounts also highlight the role of deception in connection with this eschatological rebellion. . . . Not only do the two passages have the theme of deception in common, but in both Satan occupies a prominent position in relation to it. In Revelaton he is presented as the one who deceives, and in 2 Thess 2:9 he is seen as the real force behind the lawless one’s program of deception. Finally, there is a significant similarity between the Johannine and Pauline conceptions of how the rebellion is terminated. . . . But the resemblance is even closer than this, for in [2 Thess 1:7–9] Paul, like John, associates the return of Christ with fire and the execution of final judgment on the enemies of God. “Testament writer knew anything about a ‘millennium’? Not even Paul, to whom so many wonderful secrets were revealed! Except for Rev.20, where we read, not of a millennium, but of ‘1000 years’, there is not one other reference in the whole of the New Testament, or, for that matter, the whole Bible, to this paltry science-fiction of confused eschatology. Jesus never mentioned it, neither do Matthew, Mark, Luke, John, Paul, Peter, James, the writer to the Hebrews or Jude. Can they all have been so totally ignorant of such an important event? Were they all further from the truth than our 20th century ‘end-time’ enthusiasts? Quite aside from the above, we find in the very grammar of Revelation something that proves beyond a shadow of a doubt that this ‘1000 years’ is symbolic, not literal. In Rev.20:7 (‘and when the 1000 years are completed..’), the Greek word for when is ‘hotan’, correctly translated in the Nestle and Marshall Greek Interlinear as ‘whenever’. This word, according to Thayer’s Greek-English Lexicon, is used of events which are assumed will really occur, but the time of whose occurrence is not definite (from our point of view). Strong’s Concordance says that ‘hotan’ implies more or less uncertainty (time-wise), a typical New Testament example being 2 Cor.12:10, where Paul says ‘when I am weak, then I am strong’. No time limit, or period, is indicated: simply, whenever he is weak, then he is strong. Yet there is nothing uncertain about when a literal period of 1000 years is going to end: if it is literal, it will end after 1000 years! In Rev.11:7, speaking about a symbolic period of time (1260 days), the text reads ‘..when (whenever) they have finished their testimony.., indicating that the literal time period is uncertain, although its symbolic length is stated. In Rev.20:7, where the symbolic period is 1000 years, this same word is used: whenever. I think I’m “Hidden in the Crag’s” number one fan. I LOVE HOW THE ARTICLES FORCE ONE TO “THINK.” Great writing ministry for the Lord. My personal believe on the thousand years is that it comes later. But, I’m a Jew learning this part of Christianity so I will definitely further investigate and PRAY FOR DISCERNMENT. Lately I bug G/d a lot with questions like (1) WHY DOES satan HAVE SO MUCH CONTROL? (2) Who is satan to the Almighty? Is satan a pissed off relative? **FYI: I started another YT. I’m in law (“ICE”) by day and a Rabbi at sunset and thereafter… LOL. New channel is “LAW31r1.” ICE is hated in L.A., where I’m at. Trying to get a transfer, but it’s up to our true boss, G/D. Be blessed!! More people are talking about the 1,000 yr reign timeline and Geordie Rose’ Dwave quantum theory and his 12/2/2017 warning that demons are about to make their appearance…. I’ll post links. Wish I was as smart as you. Regardless, you’re in my prayers, as well as the world in general. Be blessed.